Reagan Pointe features beautiful, affordable David Weekley planned community homes in Sanford, FL. Select your new home from a range of energy-efficient backed by the Environments for Living® Gold Level Program. Reagan Pointe is a gated community of 46 energy-efficient homes in a park-like setting. The entire community is designed to provide you with a very desirable lifestyle in a lovely home with all the amenities – pool, cabana, dog park, kids’ playground – that create a comfortable living environment. These homes are built with a security system, deadbolts on all exterior doors, smoke and carbon monoxide detectors, hurricane straps, a Sentricon Termite System and a Tubes in the walls Taexx Pest Control System. Life in Reagan Pointe is truly comfortable! But you’re not just getting the comfort of safety and convenience both indoors and out. Reagan Pointe Sanford homes are built to include so many easy maintenance and maintenance-free features that you’ll have lots of time to relax and enjoy life, too. Just take a look at the features of the homes for sale. You’ll have long-life, Shaw stain resistant carpet throughout and ceramic tile flooring in the foyer, kitchen and breakfast area, the bathrooms and laundry room. You’ll love your quartz countertops in the kitchen and cultured marble ones in the bathrooms. Outside, your fully sodded yard comes complete with a designer landscape package and sprinkler system. Of course, these are just a few of the luxurious appointments in the homes at Reagan Pointe. There are many more provided by the innovative custom designs that are the norm in David Weekley homes. 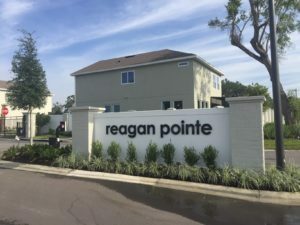 Reagan Pointe is in the fast developing south Sanford area where bus service into town is just a short walk away. The county seat of Seminole County, Sanford is a vibrant, safe city in which to raise a family. There is excellent shopping, live theater, cinemas and museums and convenient stops on the SunRail commuter rail system for commuters to Orlando in either Sanford or Lake Mary. Hiking and biking trails abound for the outdoor enthusiast, including River Walk along the waterfront and plenty of recreation centers and parks. Sanford ranks among the top ten Florida suburbs with the best public schools and these include the schools where children living in Reagan Pointe will go – Highlands Elementary, Layer Elementary School, Greenwood Lakes Middle School and Lake Mary High School. 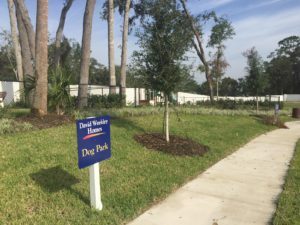 There are two series of David Weekley Homes in beautiful Reagan Pointe. The 1952 – 2329 square foot Garden Series homes are on 40-foot lots with prices beginning at $279,990. The Cottage Series homes are a little smaller, occupying 34-foot lots with 1608 – 1698 square foot floor plans with prices starting at $249,990. See yourself relaxing by the pool while the children play safely nearby? Maybe taking the dog to meet his furry friends in the dog park later? Then, the golf course is not far away or, maybe a walk by the lake with the kids and dog. There’s a great lifestyle waiting for you in one of the Reagan Pointe homes for sale. Gitta Sells can help get you in the home of your dreams.